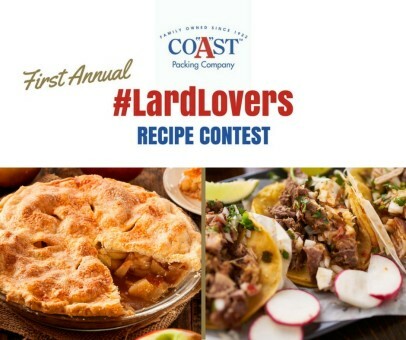 In the belief that there’s good eating – and perhaps a little gold – in those classic family recipes, Coast Packing Company, the West’s largest supplier of healthy animal fat shortenings, today announced the first-ever #LardLovers Recipe Contest. Contest entries will be accepted online starting today, September 5, at midnight Pacific time. All online entries must be received by midnight Friday, November 3. To enter, contestants can use the online form posted at http://www.coastpacking.com/lardlovers/. Alternatively, entries can be submitted via Facebook. Winners will be announced on December 8, the first (unofficial) National Lard Day. The first official observance is set for December 8, 2018, according to Chase’s Calendar of Events. The contest is open to those 21 and over, and no purchase is necessary to enter. Members of the Coast Packing Co. staff will determine the finalists in each category. Recipe finalists will be determined based creativity, visual appeal and ease of execution (how easy is this recipe to make by the average home cook). Recipes determined to be finalists will be prepared (cooked) by Coast Packing Co. staff. The top three winning recipes in each category will then be determined by the panel of food journalists based on creativity, visual appeal and flavor.